Vice President Reacts To Indictment By House Of Reps Committee On Emergency And Disaster Preparedness. Describes It As " baseless and totally false"
Nigeria’s Vice President. 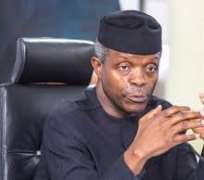 Prof. Yemi Osinbajo on Friday rubbished the report of the House of Representatives Committee on Emergency and Disaster Preparedness, which indicted the National Emergency Management Agency, NEMA, and himself on the illegal approval of N5.8 billion for emergency intervention of food security to the Northeast in June 2017. The House of Representatives Ad-hoc Committee on Emergency and Disaster Preparedness had on Thursday indicted the governing board of National Emergency Management Agency (NEMA), with Vice President Yemi Osinbajo allegedly fingered in the scam. The board, chaired by Osinbajo, was accused of illegal approval of N5.8 billion north-east intervention fund. Reacting to this development, Senior Special Assistant on Media and Publicity, to the Vice President, Laolu Akande, said Osinbajo’s attention had been drawn to a report of the House Committee on Emergency and Disaster Preparedness issued on Thursday,Nov 8, 2018, particularly in respect of funds released for “emergency intervention of food security to the Northeast” in June 2017, when the Vice Preident was Ag President. “In its report, the Committee alleged that a sum of N5,865,671,939.26 was approved and released in June 2017 vide a Memo raised from the Office of the Acting President, directing the Honourable Minister of Finance and the Accountant General of the Federation to so act. “The House Committee also concluded that the payment made was in contravention of approval of the National Assembly. This conclusion is both false and misleading. To start with, it is important to understand the context of the transaction. “This was at a time when internally displaced persons and their host communities faced very severe food shortages throughout the North East, as a result of successive poor harvests and abandoned farmlands, minimal cross-border cash crop trade and lost economic opportunities,” he said. Akande explained that on 15 April, 2017, the UN World Food Programme, a major aid organisation and food supplier to the region, had issued a warning that it would be reducing its vital support to about 1.8 million IDPs by as much as 85%, due to corresponding reduction in funding by the donor countries. He said around the same time, the United Nations Commission for Refugees in Geneva also warned of the growing risk of mass deaths from starvation among people living in the conflict areas, saying that the Federal Government of Nigeria moved urgently to prevent the looming disaster by establishing a strategic food intervention plan for the affected States. According to him, a Presidential Committee on Emergency Food Delivery to the North East was convened and tha the Committee met on the 13th of May, 2017 to kick off the process, with the then Acting President as Chairman. Other members of the Committee included: Minister of Finance; Minister of Budget and National Planning; Minister of State for Budget and National Planning; Minister of Agriculture and Rural Development; Governor of Central Bank; Deputy Chief of Staff to the President and the Senior Special Assistant in the Office of the Chief of Staff to the President. “Resulting from the deliberations of this and subsequent meetings, the approval referred to in the House Committee’s Report was, in fact, based on a request raised by the Central Bank Governor as facilitator of the National Food Security Programme, vide a letter dated May 25, 2017. “As explained in the said letter, there was an immediate need to distribute grains, including rice, maize, soya beans and sorghum, to Internally Displaced Persons through the National Emergency Management Agency. The only way to obtain the quantity of grains required was to resort to the National Food Security Progamme (NFSP) earlier established by the Federal Government as a means of shoring up its strategic grain reserves,” he stated. Akande added that it was in consequence of the Federal Government’s decision to urgently purchase the stored grains for distribution to Internally Displaced Persons that the CBN made the proposal for approval of 30,905.08 Metric Tonnes at N5,229,685,333.26, saying that of that amount, the then Acting President eventually approved N5,036,644,933.26, after excluding bagging costs, as this was pursuant to the recommendation that bagging, transportation and other logistics were best handled by NEMA. He explained that NEMA also originated a request to the Acting President, dated May 25, 2017, requesting the sum of N829,026,456.00 for general logistics, branding and packaging, tracking, security, personnel, media & publicity and contingency costs of taking the grains from their respective locations in Kano, Kaduna, Funtua, Ibadan and Gombe to Adamawa, Borno, Yobe, Bauchi, Gombe, Taraba and Jigawa States. “It is also wrong to assume that taxes and interests accruable to government from these transactions in food items were deliberately ignored or waived by neglect. Of course, we expect that any loans advanced to any of the companies would be recovered with the agreed interests, and that any profits made by such companies would be liable to tax in the usual manner,” he explained. More so, Akande said the suggestion that the grains were never delivered to the target States was also blatant falsehood, saying that in actual fact, in order to ensure effective distribution of the grains, an Emergency Food Intervention Project Team was established, consisting of the Director General of NEMA and representatives of the National Security Adviser, Chief of Defence Staff, Chief of Army Staff, Chief of Naval Staff, Chief of Air Staff, Department of State Security, Nigeria Police and the Presidency. He explained that the Committee also worked with respective State Emergency Management Agencies, as well as humanitarian agencies such as World Food Programme, International Committee of the Red Cross, and the United Nations Office for the Coordination of Humanitarian Affairs, as deliveries were publicly made directly to the intended beneficiaries. “In fact, the then Acting President personally inspected the electronic truck-tracking unit established in Maiduguri for the purpose of monitoring the transportation, and flagged off the food distribution on the 8th of June, 2017. Besides, there was the integration of a robust monitoring and evaluation system into the operation in order to facilitate a transparent and accountable process. “Therefore, all insinuations on this matter regarding purported indictments and perceived violations of due process or the constitution are baseless and totally false. Such interpretations are flawed and should be utterly ignored,” he stated.